Caring Cervical Realignment Therapy (CCRT) was developed by Ross Hauser, M.D. after decades of treating patients with neck disorders, including cervical instability and degenerative disc disease, to provide long-term solutions to symptoms such as headaches, neck pain, dizziness, vertigo, lightheadedness, imbalance and a host of other symptoms attributed to neck injuries. CCRT combines individualized protocols to objectively document spinal instability, strengthen weakened ligament tissue that connect vertebrae, and re-establish normal biomechanics and encourage restoration of lordosis. 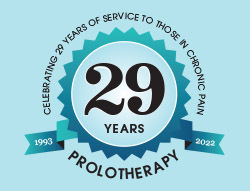 CCRT is the ideal program for patients who want lasting pain relief and symptom resolution in order to discontinue pain medication and other treatments that only focus on short-term relief, as well as those looking to avoid spinal surgery or who have already failed surgery. 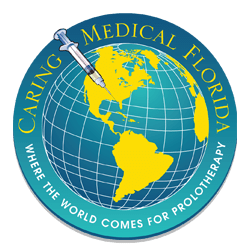 For many years, Dr. Hauser and the Prolotherapists at Caring Medical have had tremendous success treating patients who were suffering from chronic neck pain. 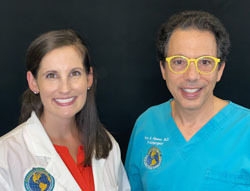 Though most of the cases were already failures in the traditional pain management system, Dr. Hauser’s team was able to help the majority of these tough pain cases. In some patients, though, symptoms would return. Through extensive research and patient data analysis, it became clear that in order for patients to obtain long-term cures (approximately 90% relief of symptoms) the re-establishment of some lordosis in their cervical spine is necessary. Once spinal stabilization was achieved with Prolotherapy and the normalization of cervical forces by restoring some lordosis, lasting relief of symptoms was highly probable. We are upright beings and an enormous gravitation force transmits the weight of the body from our head into our spine and peripheral joints. The force at any one time in our joints can be many times our body weight. The normal spinal curves (cervical and lumbar lordosis and thoracic kyphosis) allow the spine to handle 20-30 times the forces that could be handled if the human spine was completely straight (called a military spine). (See Figure 1.) The normal cervical spine looks like a “C” and this position is called lordosis. This curve is essential! When a person loses this curve, the forces can increase 5-10 times on structures such as the facet joints and cervical discs.1 Increasing the force per unit area on the various structures in the neck accelerates their breakdown and leads to spinal degeneration with a variety of disabling symptoms. Modern life can ruin our normal C-curve! While the lower back has the large, strong core musculature to help with spinal stabilization the cervical spine does not, it relies anteriorly on the intervertebral discs and posteriorly by the posterior ligament complexes. The exception to this is the upper cervical spine (C0-C2) which has no anterior disc support and whose sole structures for stability are the upper cervical ligaments. Of particular importance are the capsular ligaments that surround the facet joints that control much of cervical spinal motion.4 When the ligaments overstretch and/or tear from whiplash injury or creep (the slow stretching of ligaments over time, such as from forward head posture), spinal motion is excessive, risking injury to the spinal cord or nerves. A person is said to have spinal instability when nerve function is affected because of the excessive vertebral motions. Figure 5. 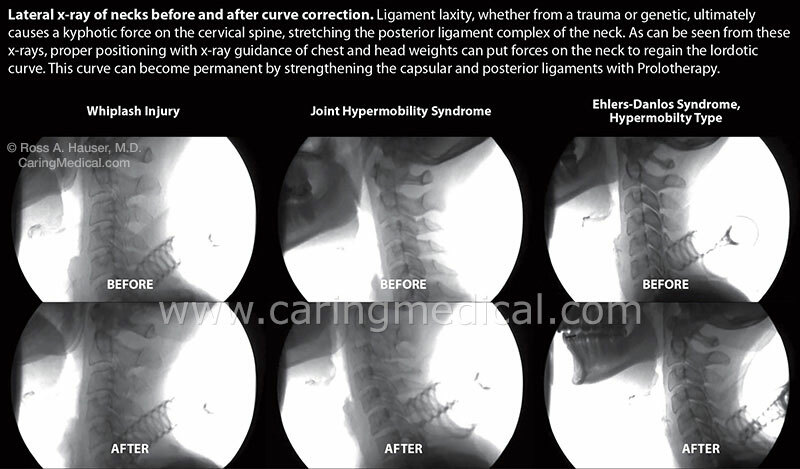 The Horrific Progression of Neck Degeneration with Unresolved Cervical Instability. 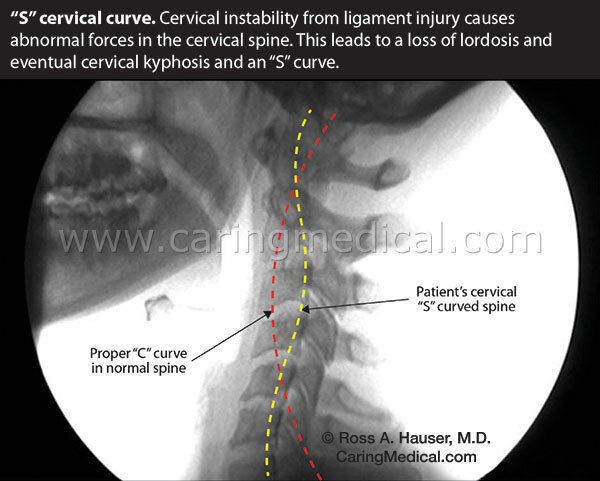 Cervical instability is a progressive disorder causing a normal lordotic curve to end up as an “S” or “Snake” curve with crippling degeneration. When the force per unit area becomes greater than the strength of the tissue, the results are tissue injury and pain. (See Figure 7.) Since joint instability is the cause of almost all chronic pain,7 curing chronic pain involves tightening the loose joints by stimulating the appropriate ligaments to tighten, and then resolving the destructive joint forces. The destructive joint forces occur in the cervical spine because of a loss of the normal curve and the ligament laxity which initiated and is perpetuating the condition. As the tissue weakens further, destructive joint motions are produced every time the joint is used, creating a vicious cycle of worsening joint destruction and pain. 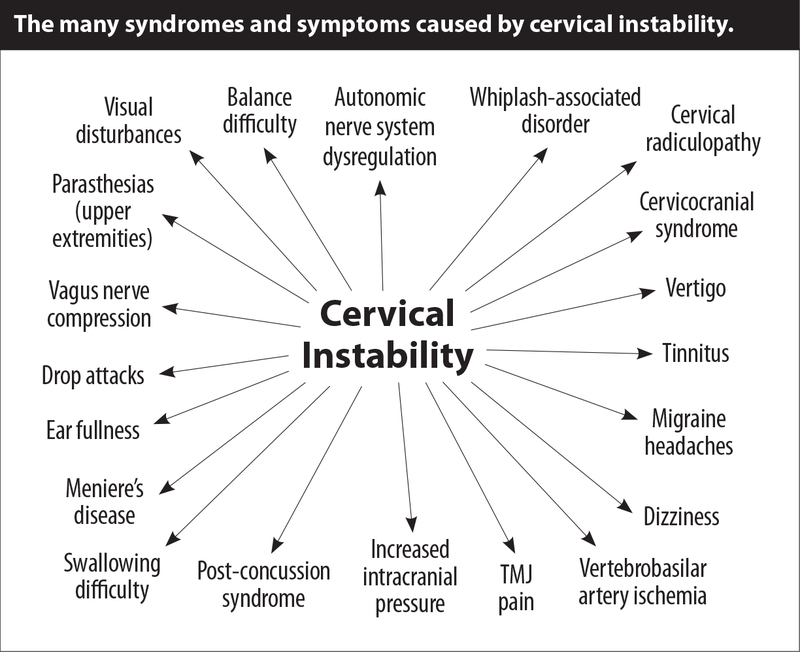 The way to stop this cycle is outlined in Caring Cervical Realignment Therapy (CCRT). Establish spinal stability by ligament tightening through Prolotherapy (may include Platelet Rich Plasma or Stem Cell therapy). Limit specific spinal forces to allow ligament tightening during the initial treatment course. Attain more normal biomechanics of the cervical spine by improving spinal curves and restoring lordosis in order to reduce long-term cervical forces. 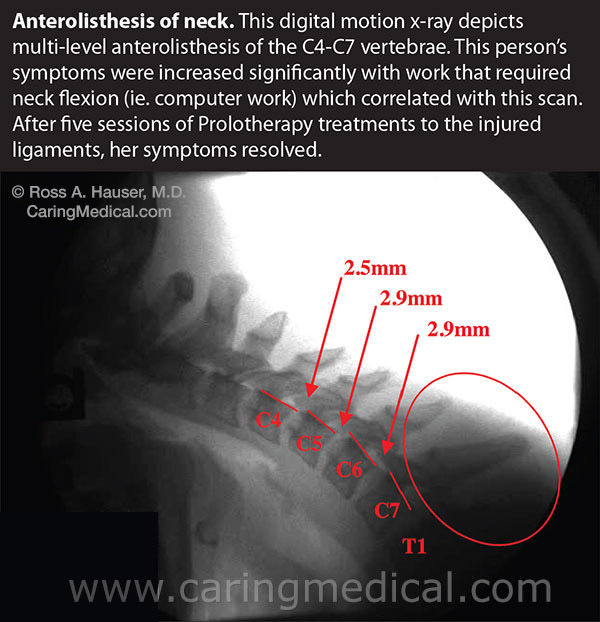 When cervical instability is suspected as the culprit for the person’s condition a digital motion x-ray (DMX) is performed. 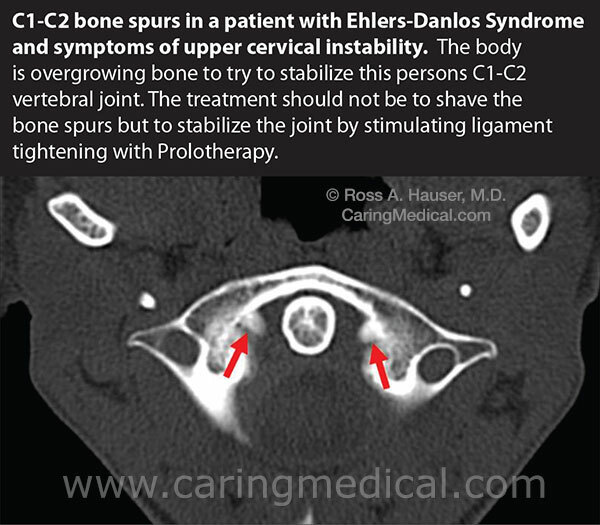 A common finding is instability from C1-C5 and restriction or fusion from bone spurs from C5-C7, along with kyphosis or reversal of the normal cervical curve (See Figure 9.) Together with the medical history and physical exam, DMX provides valuable insight for developing the treatment protocol. 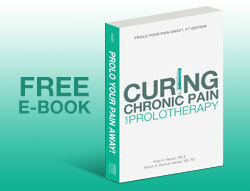 A certain number of Prolotherapy visits to resolve the instability. An initial period of cervical immobilization with a cervical collar in order to limit neck forces while the ligaments regenerate. Rescanning every two visits to ensure the Prolotherapy is resolving the instability. When improved spinal stability is demonstrated, CCRT using cervical weights will be started. In some severe spinal curves, CCRT using cervical weights is started immediately. Changing the spinal curve can take just minutes for some patients to several months in others. The treatment regimen is continued until the person can do all desired activities with minimal symptoms and spinal curve kinematics (curve) are improved. 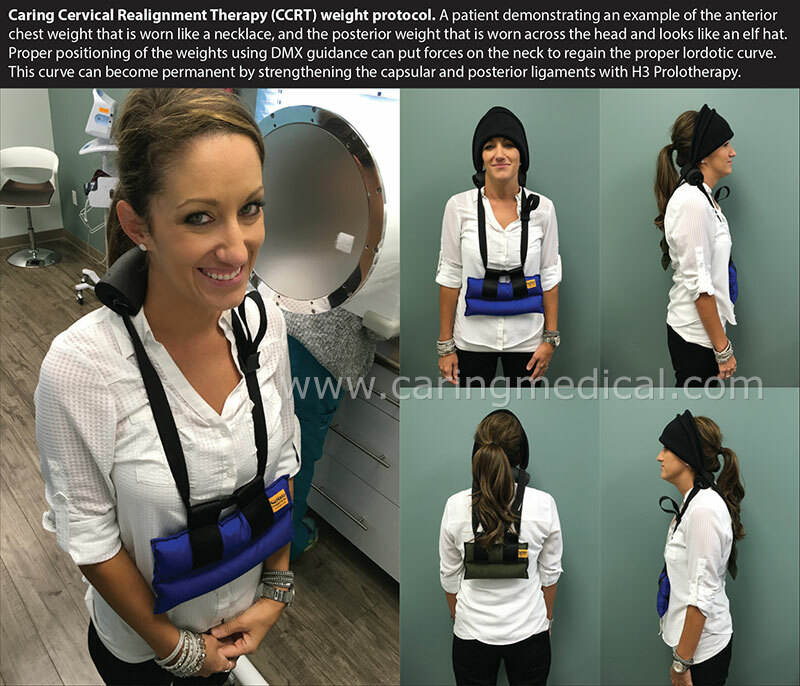 Individualized cervical weight protocols are prescribed during CCRT. These weights help postural distortions by placing appropriate forces onto the neck to change alignment.8 The weights can include the use of anterior or posterior head weight and/or an anterior chest weight. (See Figure 10.) The vector of force is determined by the motion scanning and lateral x-rays. The more rigid the spine the more weight that is required and for a longer period of time. Many of Caring Medical patients work up to using the weights 30 minutes per day but may start out with just one minute per day. Patients are instructed on the use of the weights and monitored by periodic x-rays/motion scans as well as symptom resolution to make sure the regime is successfully improving the patient’s cervical curve. Harrison DE, Harrison DD, Janik TJ. Comparison of axial and flexural stresses in lordosis and three buckled modes of the cervical spine. Clin Biomech 2001;16(4):276-284. Hansraj, KK. Assessment of stresses in the cervical spine caused by posture and position of the head. Surgical Technology International XXV. 277-279. Park SY, Yoo WG. Effects of sustained computer work on upper cervical flexion motion. J Phys Ther Sci. 2014;26:441-442. Sherekar SK, Yadav YR, Basoor AS. Clinical implications of alignment of the upper and lower cervical spine. Neurology India. 2006;54:263-267. Scheer JK, Tang JA, Smith JS. Cervical spine alignment, sagittal deformity, and clinical implications. A review. Journal of Neurosurgery: Spine. 2013;19:141-159. Hauser RA, Blakemore PJ, Wang J, Steilen D. Structural basis of joint instability as cause for chronic musculoskeletal pain and its successful treatment with regenerative injection therapy (Prolotherapy). The Open Pain Journal. 2014;7:9-22. Saunders ES, Woggon D, Cohen C, Robinson DH. Improvement of cervical lordosis and reduction of forward head posture with anterior head weighting and proprioceptive balancing protocols. J Vertebral Subluxation Res. 2003; April 27:1-5.